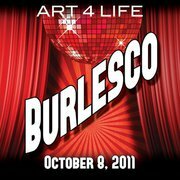 Don’t miss Art 4 Life – Burlesco! Just because ArtAID is now an every-other-year event, doesn’t mean that the party has to stop! Join us this year for a new event, Art 4 Life. Art 4 Life will have lots of entertainment from the minute you walk in the door until you leave. Dancers, music, artists and performers of all kinds will keep you entertained throughout the evening. Don’t miss your chance to bid on incredible art in the live and silent art auctions; enjoy delicious food at food stations around the Cotillion and don’t miss the musical/dance revue “Burlesco” featuring Christi Moore, Monte Wheeler, Kyle Vespestad, Karen Robu, Adina Ronee the Wichita Burlesque Co. and more than 30 dancers! All money raised goes to Positive Directions, a non-profit organization that helps people in the Wichita area who live with HIV/AIDS. Sponsored by Stella Artois, Christopher Clark Designer Portraits, The Bar’s Open, 104.5 The Fox, Cabaret Oldtown and SoNu Events. How much: Tickets are $65 in advance and $75 at the door. Available at Positive Directions, Planet Hair, Bluebird Arthouse and The Cotillion Ballroom. Reserved tables are available, contact James Woods for more information at 263-2214 x109.